This is the ninth printing of the first edition of INTO THIN AIR. A PERSONAL ACCOUNT OF THE MOUNT EVEREST DISASTER by John Krakauer. This book was published in New York by Villard Books in 1997. This is the same as the first printing other than the different text on the copyright pages. Everything else is the same as the first printing. The book measures 242mm tall x 157mm, and has 293 pages, 12 b/w photos, several b/w illustrations, EP map. 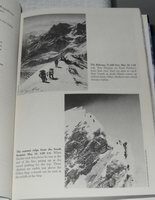 Runaway best seller about the May 1996 Everest events on and above the S Col that led to deaths of five climbers including lead guides Scott Fischer & Brian Hall. This is a good read, better than any fictional account of climbing Mt Everest. CONDITION: Original light grey boards, white spine, silver lettering cover & spine. The book is in fine condition with no previous owner marks or writing on any pages, clean, no foxing, tight binding, almost like new. The original dust jacket is in fine condition with no chips and no tears. Price: $5.